Jane Wrigglesworth extols the virtues of a shade-loving, frost-hardy ground cover that bears dainty flowers come spring. If ever there was a ground cover to celebrate, ajuga must surely be it. This is a plant whose foliage is showy enough to hold its own. Soft, spatulate leaves come in green, purple, bronze, pinky-green or variegated cream and maroon, and a single plant can spread to form a vast carpet of leaves about 5-8 cm high. Think of your common garden variety mint (from which family the ajuga belongs to) and you get some idea as to how prolific this plant can be. Certainly, the foliage may be your main reason to grow ajuga, but come spring or early summer the plant sends up spikes of dainty white, pink or deep blue flowers, up to 20 cm high in some cultivars. In favourable conditions, flowering will even continue for up to three months. If you need one more reason to convince you of this plant's worthiness, it would have to be that ajugas are particularly enthusiastic about shade. Even the most dreaded shady spot in the garden can be transformed by the humble ajuga. And whilst we're on the subject of positive attributes, the ajuga is also frost hardy. In fact, it's pretty much trouble free. It would be fair, however, to issue a warning at this stage. Given perfect conditions, the ajuga may be considered, by some, to be a weed. In fact, neighbouring plants can find themselves being smothered by this prolific grower, but if this is the case, the ajuga can easily be controlled by regularly snipping. Those "perfect conditions" I refer to are moist soil and shelter from the strong sun, although you may find the variegated and bronze-leafed forms will develop their colour better in the sun. Ajuga will tolerate short periods of drought, but its shallow root system means it requires moisture, particularly during hot summer days. Whilst warnings are often issued against the pesky snail, I have never before found a snail attacking the leaves of my plants. Perhaps this is because I have rengarenga (Arthropodium candidum) growing nearby, a veritable feast for these slimy molluscs. Nonetheless, snails should be regarded with some suspicion if seen in the near vicinity of your ajuga. Ajugas can be used in all sorts of situations  on moist banks, in between pavers, at the base of potted standards or topiary, beside paths, at the front of borders, or even to offset other plants. Ajuga 'Burgundy Lace' (above right) looks particularly stunning against the black mondo grass or other contrasting foliage. 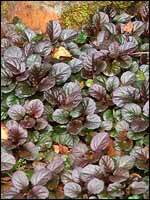 As Ajuga reptans spreads by surface runners (like a strawberry plant), it is very easy to propagate by division. Just pick off a couple of new plants and transplant to another area of your garden. Make sure there is no soil in the crown of your plant, as ajugas are susceptible to crown rot when wet and soggy. This is caused by a fungus that attacks the plant, causing it to wilt and die. On the whole, though, ajugas are a breeze to grow. They don't mind frost nor do they mind shade. They grow relatively quickly to cover unsightly spots. They even possess a favourable bloom. What more, I ask, could you possibly want?